Whether it’s your fist time out or you are a seasoned angler, join Hawk Eye Fishing Charters Inc. for an exciting and unforgettable fishing trip. You will be fishing out of a custom 27 ft. Gravois Aluminum Center Console or a 25 ft. plus extreme MAJEK center console with state of the art equipment. This is dependent based on time of year. We can also accommodate large and corporate groups. An adventure of a lifetime is awaiting you from the moment you step into the boat. Your day will begin at safe light as you cruise the bayou during a beautiful sunrise and get a glimpse of the abundant wildlife and stunning landscape. Capt. 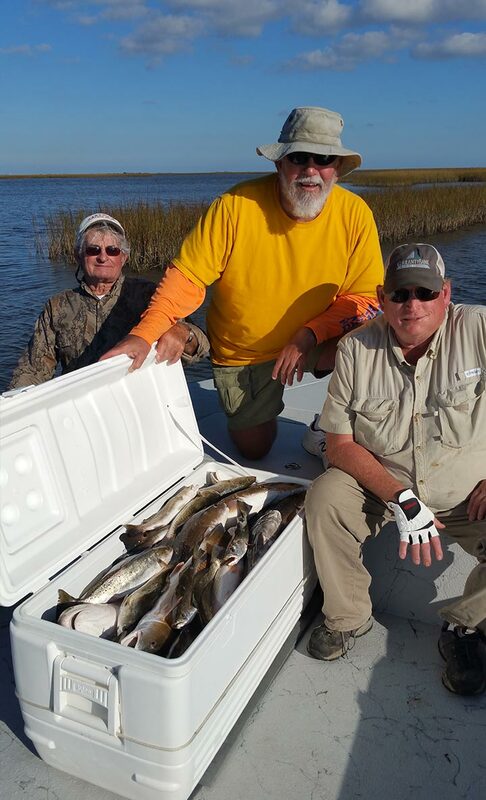 John will work hard to put you on the redfish and speckled trout that the south has to offer. Specks and reds are some of the most exciting fight you will every encounter. Then you can sit back and tell fish stories on the ride back with a nice breeze and not a worry in the world. The trip includes everything you need to catch the “big one”. Supplied is spinning rods & reels, live and artificial bait, fuel, ice, and fish cleaning and packaging. You will also receive a generous portion of southern hospitality, many stories, and a fun-loving guide. You will need to bring your camera, sunscreen, hats, food and drink, plenty of water, fishing license and anticipation for what the day will bring. Don’t forget an ice chest to bring your cleaned fish home. If you have a rod and reel you like to fish with you are welcomed to bring that as well. Please, only soft sole shoes. For non-residents, you can purchase your 3 day charter boat trip fishing license for $10.00 by calling 1-(888) 765-2602, or online at Louisiana Department of Wildlife & Fisheries, or at any sporting goods store. This license is good for 3 consecutive days of fishing on a chartered boat. If captain cancels trip prior to departure, 100% REFUND is issued or trip is rescheduled. If the party cancels within 7 days of scheduled trip, the deposit is forfeited. If the party cancels within 14 days of scheduled multi-boat trip, deposit is forfeited. If the party cancels after departure, NO REFUND. Your Guide will determine whether or not to cancel the trip due to weather. You cannot call 2 days prior and decide the weather is not perfect and you want to cancel the trip. Please call for rates and availability. All trips require a 50% deposit of trip total to reserve the date.